The Windows 10 April 2018 Update introduced a new way for Windows 10 Pro users to better safeguard their systems. Protect your PC with Application Guard for Microsoft Edge (and Internet Explorer) to isolate your computer from malware and attacks. 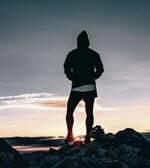 Using a Hyper-V-enabled container, Microsoft Edge isolates you from threats using a virtual environment that is separate from your operating system. Because the container is isolated, your computer is not directly exposed to a malicious site. 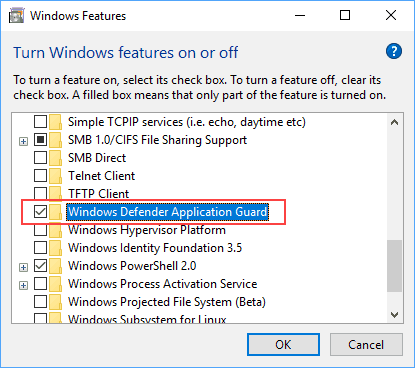 Windows Defender Application Guard was first introduced in the Windows 10 Fall Creators Update. However, it was only introduced into the Enterprise edition. The April 2018 Update made the feature available to Windows 10 Pro users, and even then, only under certain conditions. Application Guard requires a 64-bit computer with at least 8 GB of RAM, and 5 GB of free disk space, among other items. To turn on Windows Defender Application Guard, launch your computer’s Control Panel. Click Programs. Under Programs and Features, click the Turn Windows features on or off link. Scroll down to Windows Defender Application Guard, and check the box. Click OK to continue. 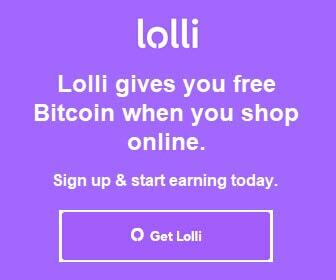 For the change to take effect, restart your computer when prompted. Once your computer restarts, launch Microsoft Edge. Click the Settings and more button in the upper-right corner, and select New Application Guard window. Much like a new InPrivate window launches, a separate Application Guard window loads. Notice the orange Application Guard tab in the window to differentiate it from a regular Edge window. Also, note the Windows Defender icon overlays the Edge logo in the taskbar to differentiate the Application Guard window from a normal Edge window. Application Guard for Microsoft Edge. So what? When you choose to browse with an Application Guard for Microsoft Edge window, you safeguard your computer from malware and attacks. That is because you are browsing the internet using a separate browsing environment apart from your host machine. Nothing you do in an Application Guard window will impact your computer. Additionally, because it is a separate environment, Application Guard has its own browsing history and bookmarks. You won’t see your Microsoft Edge bookmarks or history in an Application Guard window as a result. 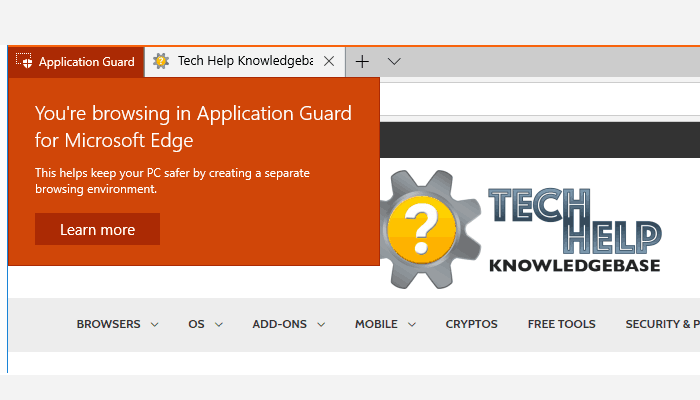 Thank you for visiting Tech Help Knowledgebase to learn more about how to Protect your PC with Application Guard for Microsoft Edge.